To some, a flag may just be a piece of colored cloth, but to others it brings to mind many feelings: protection, victory, challenge, submission, pride, honor, threat, loyalty, and hope. Patriots often express love of their country by hoisting flags; victorious armies humiliate their enemies by displaying captured flags and dictators use flags to help mold public opinion. The date of the earliest flag is unknown. However we do know that some of the first flags consisted of carved emblem on top of poles with ribbons attached below. Nature themes, especially wild animals, were popular symbols for the flags. The practical use of the flag became evident fairly early in history. 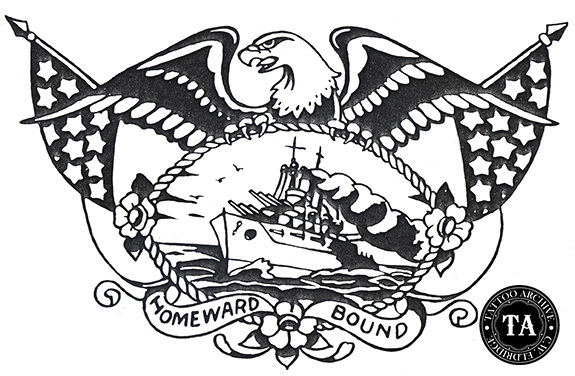 A flag could be used to identify the rank of a commander, indicate tactical directions on the battlefield, signal the intentions of a ship and show its place of registration, and inspire men and women undertaking difficult and dangerous tasks on behalf of their country. 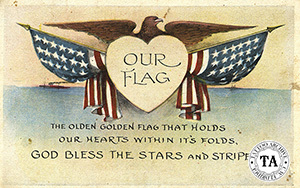 The "Our Flag" postcard seen above may have inspired many a chest piece. The study of flags, (vexillology) tells us that there are correct and incorrect ways to display the flag. While in Green Bay, Wisconsin for a tattoo convention, I picked up a local paper and found several articles and letters to the editor about the flag etiquette issue. As many of you may know, Reggie White, a beloved ex-Green Bay Packer, passed away the day after Christmas, 2004. To show their feelings of loss the team decided to lower the American flag to half-mast at Lambeau Field. This angered many local patriots who felt it inappropriate to lower the flag for a sports star and not for the men and women dying in the military during this time of war. From the variety of letters in the Green Bay paper this event brought up varied emotions and questions among the locals. We are seeing this more and more in the United States: the US Postal Offices lower the flag for the Postmaster who passes away, city buildings lower the flag when a city worker dies, and often schools do this when one of their students die. There are many who think that these instances are inappropriate from the perspective of our national symbol. 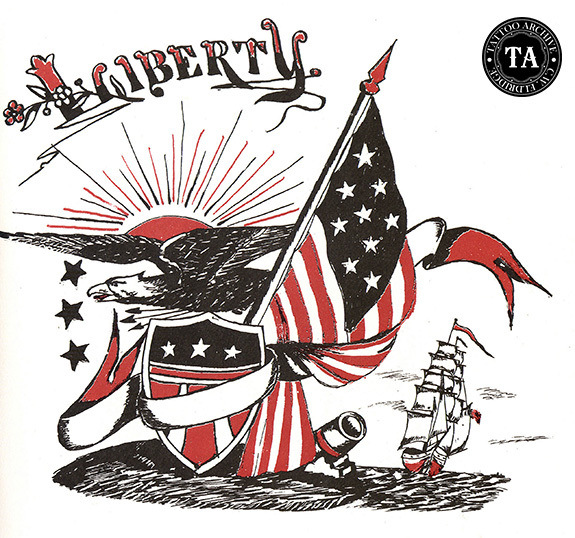 Here at the Tattoo Archive, we feel that flag tattoos are the backbone of the tattoo world. Appropriate or not, flags from all nations are popular tattoo designs. After 9/11 tattooists around the country and probably from around the world were swamped with demands for flag tattoo designs. While doing research for this article I was browsing the United States history website and came upon the "Often Asked Questions" section about flag etiquette. One of the questions was, "I am thinking of getting a flag tattoo. Is it okay?" The response was, "There is nothing in the Flag Code about tattoos. The question is one of respect for the flag. In this case one person's respect is another's disrespect, and we advise against a flag tattoo. Perhaps an American eagle would look good?"